There is no doubt in my mind that we live in a very special town with a bunch of very special people who do amazing things that help make up the character of Wincanton. Sometime those special people live right under our noses and we simply just don't realise how special they are till something pops up and punches us on the nose. That happened a few years back when we had an excellent art exhibition. Maybe some of you will remember a weekend when our High Street shops were converted into a High Street Art Gallery. It was called "Windows of Wincanton". It was nothing to do with the Wincanton Window. The name was just a close semblance. That weekend went very well. The organisers did a great job, and I hope that sometime in the not too distant future, that we will bring about another such event. During the weekend I was looking at all the offerings when I was brought to a halt at the Totally Floored window. Their window had a selection of beautiful water colour by a local lady, Margaret Kelly. I couldn't believe my eyes. I had known Margaret through Church work for many years, and had no idea whatsoever that she was an artist, never mind a good artist. He water colours stood out to me. 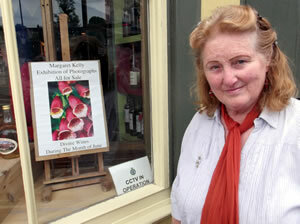 In more recent times Margaret had an exhibition at Divine Wines courtesy of Jenny, the owner. And now she is back within those hallowed walls with another exhibition, this time featuring some of her many photographs. I met Margaret recently and joined her for a wander round Divine Wines having a peek at her work. If you pick up one of her leaflets at Divine Wines you'll soon see that her inspiration started way back with a strong family influence. Margaret is not a nationally renowned artist/photographer, but it's clear to anyone who sees her work, that she is inspired, and it's that inspiration that adds to the character of Wincanton today. Margaret is indeed one of Wincanton's treasures to be valued and encouraged. So please do pop into Divine Wines and see her work for yourself. 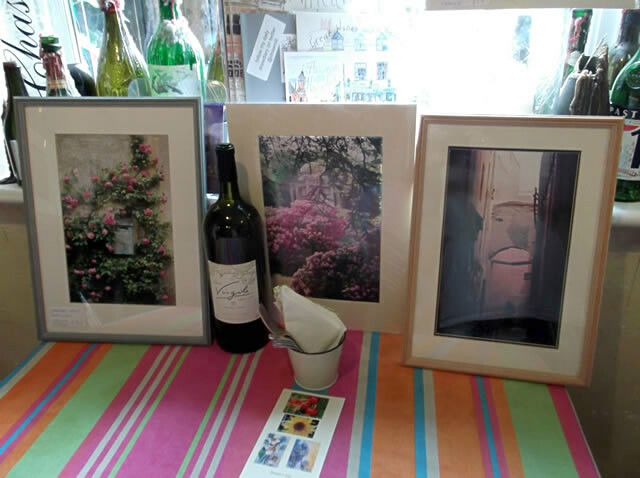 All the photographs on display are available for sale. They will make some very fine framed pictures for your homes. I'm sure that Margaret is one of many treasures in Wincanton. Maybe you know of others. Let's have a treasure hunt - contact us and let us know about the treasures that you know about.